The evolution of music follows the line: rhythm, melody, harmony. In primitive music, rhythm is the more important element. As civilizations evolve, their music also develops melodies. This happened with Eastern peoples, Jews and Greeks. In Western Europe as well, music is initially monophonic and vocal, because their voice is the one instrument that is available to every human being. Musical instruments take a subordinate role. Only afterwards comes the evolution to harmony. In Europe this happened after 1200 AD. In the 9th century, there is an interest in multiple voicing, although at first it is merely a duplicated monophony. The second voice moves in parallel with the first. From the 11th century on, music evolves away from the parallel movement : This is called counterpoint. This will eventually evolve into the art of true polyphony where all voices have equal importance. At first, 'official' music was composed only for religious purposes. The reason for this is that the Church pervaded every aspect of medieval society and also controlled education. Musicians were trained by the Church, often in Abbey schools, where their entire musical attitude was directed towards religious composition. For 150 years composers from the low-lands near the North Sea dominate and bring the art of composition to new heights and spead their art throughout Europe. 5th Dutch School: 1560 - 1590 --- Orlando di Lasso. Philippe de Monte, Jacobus de Kerle. These composers were masters in polyphonic art forms like the motet (a multi-voice vocal religious composition) in which sometimes different texts were used; and multi-voice settings of the various parts of the mass: Kyrie. Gloria, Credo. Sanctus en Benedictus, Agnus Dei. The composer Adriaen Willaert became organist and m.d.c. at San Marco in Venice. He became the founder of the Venetian School which developed the madrigal, a secular counterpart of the motet. Texts are often platonic love songs. Because these Franco-Flemish composers were internationally renown and also often worked outside their country of origin, their works are rarely on Dutch texts. During the 4th Dutch school, protestant church music is developed in Germany by composers like Jhann Walther and Jacobus Gallus (aka Handl); Hans Leo Hassler, Michael Praetorius en Heinrich Schütz. French contemporaries are Goudimel, Bourgeois and Lejeune. During the 5th Dutch School, Giovanni Palestrina - active in Rome - brought the Roman Catholic church music to new heights. During this period instrumental music became an art form in its own right with composers like Jan Pieterszoon Sweelinck (1562-1621), organist at de Old Church in Amsterdam; Giovanni Gabrieli (Venetie) and William Byrd (Engeland). By the end of 16th centurythe foundation was being laid in Florence for the creation of the opera by Claudio Monteverdi, following the example of the ancient Greek tragedies, for which they had a great interest at the time of the Renaissance. The development of this form of composition will result. that the spelling is much less polyphonic, but more homophone, i.e. where the main melody voice is made more important, to which the other voices adapt. The polyphonic style is reminiscent of horizontal lines, which together provide a sound picture. music sample: Christ lag in Todesbanden by Joh. Walther. The homophonic style is reminiscent of a horizontal line, against which vertical lines (the accompanying chords) are placed. 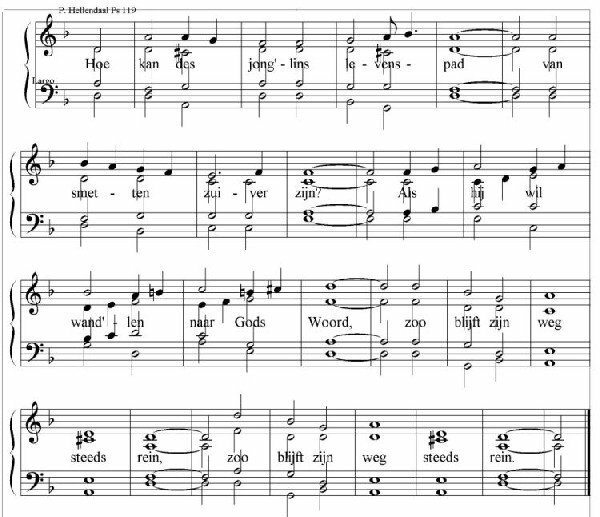 music sample: Psalm 119 by P. Hellendaal. .
During the Renaissance and subsequent Baroque (ca. 1600-1750) the secular art is being developed much stronger. Also, the entire musical development is going much stronger in the direction of the instrumental music, of which in Italy: Corelli. Vivaldi and Scarlatti; in France: Lully and Rameau; in Germany: Telemann and JS Bach; and in England: Purcell and Handel are the leading masters. During that time there are still followers of the old Catholic church music, as Lotti and Caldara. The Protestant church music had at that time masters like: Buxtehude, Pachelhel, Tunder and Böhm who developed the spiritual cantata, an instrumental unaccompanied vocal composition. Both from this and separately, the spiritual counterpart of the opera, the oratorio, is being developed thanks to great composers as Graun, Bach and Handel. The Netherlands have only a few composers of renown. We mention Willern the Fesch and Pieter Hellendaal. The end of the 18th century brings a huge revival of the development of instrumental music, especially of orchestral music, but also a decline of vocal church music. It is the time of the classical masters. like Haydn (1732-1809), Mozart (1756-1791) and Beethoven (1770-1829), who also engaged in the vocal sacred music, as evidenced by famous compositions: Nelson-Messe, die Schopfung (Haydn) , Krönungs-messe, Requiem (Mozart), Mass in C and Missa Solemnis (Beethoven). This music however, has a strong focus on the concert hall. The time of Romanticism (ca. 1815-1914) that follows also produces composers engaged in the vocal music. First of all opera composers. such as Rossini, Donizetti, Auber, Lortzing, von Weber, Wagner and Verdi. But oratorios were also composed, such as by Schubert (Masses), Mendelssohn-Bartholdy (Elias. Paul), Schumann (Das Paradies und die Peri) and Brückner (Masses). Schubert and Brahms also wrote many smaller choral compositions. Around 1809 Carl Zelter founded in Berlin the first Liedertafel, which soon was much imitated. These were originally small groups select group of singers, who sang together to socialize. From this developed the male choirs. After the First World War there was a renewed interest in church music, especially in German-Protestant circles, with composers such as Pepping, Distler and Reda. Also oratorios are composed by Honegger (Jeanne d'Arc au bûcher, Roi David); Tippett (A child of our time) and Britten (War Requiem). But with growing nationalism and a revival of popular music there is a great interest in composing secular choral music, as by Orff (Carmina Burana), Hindemith, Bartók, Kodály, Britten; and in the Netherlands Badings.